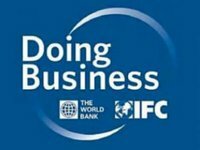 Ukraine has climbed four positions in the Doing Business 2018 ranking of the World Bank, ranking 76th among the 190 economies studied, according to a press release from the Better Regulation Delivery Office. According to the document, Ukraine this year has advanced 105 positions in the field of ease of obtaining construction permits, 41 positions in the indicator of "tax payment," two in terms of "connection to power grids" and one in terms of "settlement of insolvency." At the same time, Ukraine fell by 32 positions in the ease of creating new companies, 11 positions in protecting minority shareholders, nine positions in the ease of obtaining loans, four in the ease of international trade and one in the ease of registering property and enforcement of contracts. As reported, according to the Doing Business 2017 rating, Ukraine ranked 80th among 190 countries, in the Doing Business 2016 rating (updated in accordance with the methodology used this year) it ranked 81st among 189 countries.